For centuries, people from around the world needed to hunt for mushrooms in diverse rain forests and jungles just so that they can add this ingredient to their meals. As years passed, scientists have found a way to cultivate these mushrooms in secluded facilities by sealing off sunlight and with the help of modern day technology. 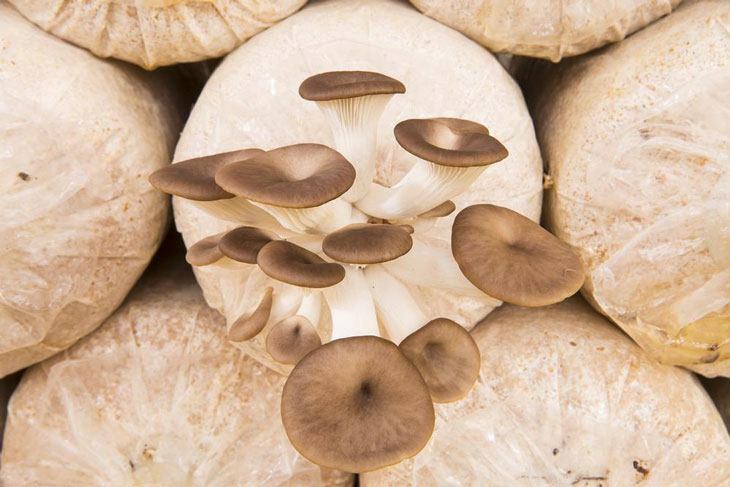 Today, you can grow these mushrooms with ease in the comfort of your home. You don’t ever need to buy mushrooms in the grocery or hunt for some in the nearby forest; you just need to be patient and wait for it to grow in your home. Mushrooms are an umbrella shaped fungus that produces a fleshy and edible body commonly found above ground in forests. You might be wondering if you would need a lot of complicated equipment to grow these mushrooms, well the answer to that is a big No! 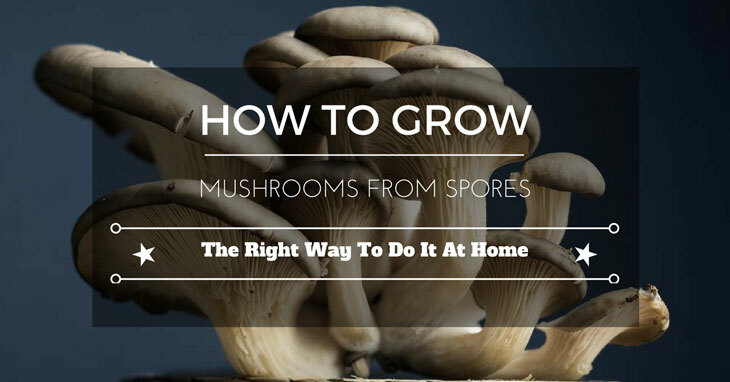 Items that can be found in your home is enough to make these mushrooms grow. 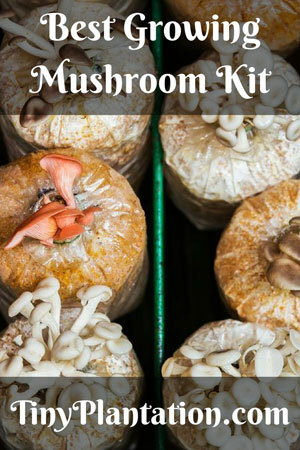 Trust me on this when I say that it’s easy because in this article I’ll be teaching you step by step on how to grow mushrooms from spores at home. The above ingredients are the most common tools you need to grow mushrooms in your household or garden. Now that you have a general idea on what to use, it’s time to learn the procedure step by step starting with the preparation of the Substrate. Combine the vermiculite and water in the plastic container, mix it thoroughly that the vermiculite is soaked with water, after which add the rice and the flour to the mixture to coat the vermiculite. In this step, make sure that the ingredients are evenly mixed and that there is a little water left in the plastic container. This is important because this mixture will serve as your base of the mushrooms to grow. Using the pressure cooker, sterilize the jars or drinking glasses that you would be using for the substrate mixture. If you don’t have a pressure cooker, just boil up some hot water and place some in the jar for 15 minutes, cool the jars for at least 10 hours after sterilizing. Make sure to follow the directions accurately. Sterilizing the jars before placing the mixture eliminates the possibility of contaminating the substrate. That’s why it’s important for you to sterilize the jars properly, you don’t want to grow poisonous mushrooms now do you? Make four to five holes scattered evenly around the lid into each jar using a needle. The holes on the lid need to be about 1/3 inch in diameter for the Polyfill to enter. The holes on the lid serve as the gateway for the spores to later on a mix with the substrate which will also be the pathway of the Polyfill to decontaminate the jars. Fill each jar with the substrate mixture after the jars have cooled down from sterilizing. Fill only half of the jar for the mixture to grow and put the lids on each jar. Make sure that the mixture is loose and not too wet, because the water inside the jar may affect the overall temperature of the mixture as it grows. Use the syringe to stuff in contaminant-repelling Polyfill into each hole. Polyfill is a polyester fiber that you can buy at your local hardware store. 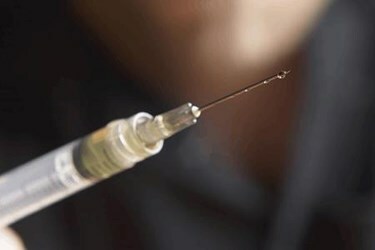 Sterilize the syringe by using the lighter to heat up the needle for about ten seconds. 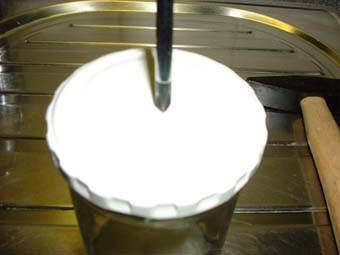 Clean the needle with a cotton ball soaked in the alcohol after sterilizing it. Take note because this is important, you don’t want to contaminate the other jars with one another because if you do when one of the jars fail to grow a mushroom, the other jars will also follow. The final step in preparing the substrate is by inserting the sterilized needle into each hole of the lid for the spore to pass through. You need to carefully pass it through the Polyfill until the needle hits the substrate mixture. 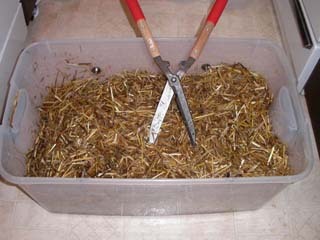 Inject a total of 100 ccs of the spore into the mixture of every jar and store it in a cool, dry room away from the sun. Re-sterilize the needle after each injection to avoid contamination of each jar. Using a liquid culture as a base rather than the syringe method is more reliable and effective because the Mycelium is already active. But because the syringe method is much cheaper than the liquid culture, a lot of people prefer this method as a result will just be the same. Now that you’re done with preparing the substrate, In the next procedure below I will teach you on how to cultivate the mushrooms you’ve made. After placing the jars in a cool and dry room, make sure that the temperature inside the room stays between 85 and 89 degrees Fahrenheit. 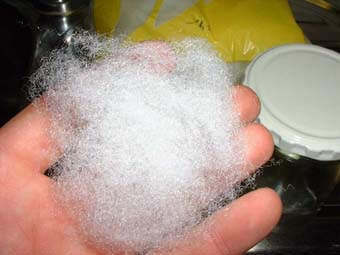 A white web-like material called the Mycelium will soon form in the jars with the substrate and spores. 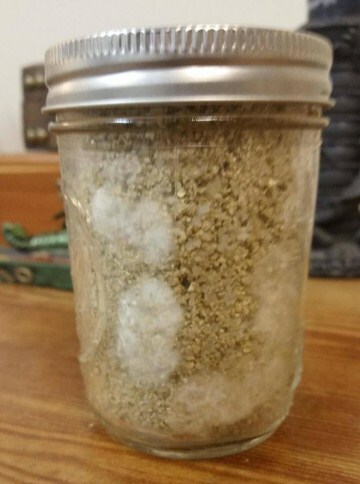 Take note that if the color of the Mycelium is not white, you should throw out the entire jar and start over because poisonous mushrooms might grow in that jar. Wait for the Mycelium develop until it has completely overtaken the substrate with its white web-like material. 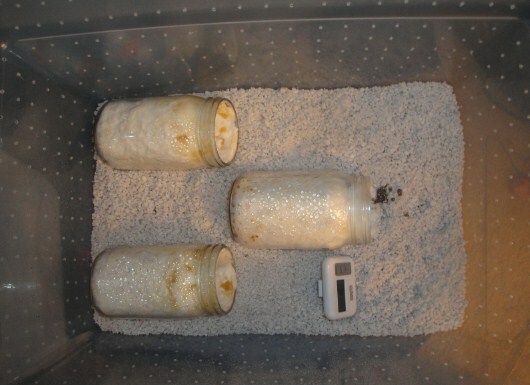 It may take a few days for the Mycelium to completely cover the substrate until then refrain from moving the jars and avoid at all costs exposing it to the sun. When you start with spores, it needs time to germinate and come to life, then start colonizing the substrate and form into Mycelium. 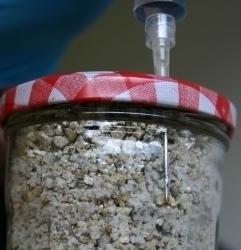 Bring a plastic container to the glass jars and layer one inch of Perlite in the bottom of it. 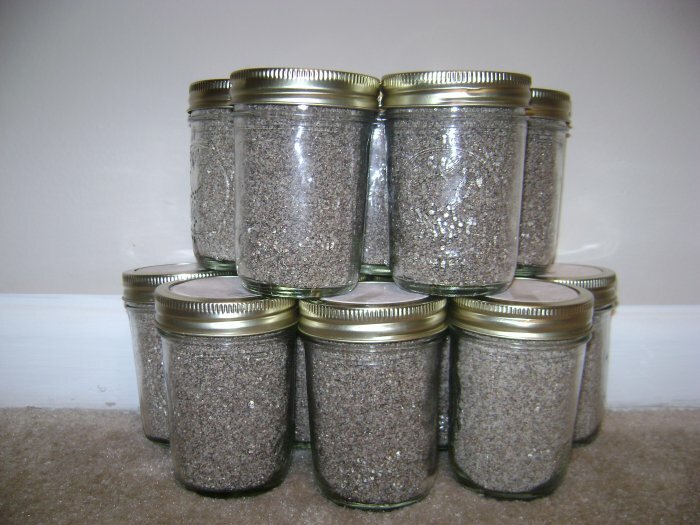 Move the jars towards the container, and place it as smoothly as possible into the Perlite. Now the waiting game begins, check the jars daily for the growth of your mushrooms and open the container to provide fresh air. Within two weeks you should probably now notice some pinhead mushrooms beginning to sprout. And finally, the last step of this tutorial is the harvesting of the mushrooms you’ve worked so hard to grow. Once they reach the size you want, you can harvest it for your consumption, or you could share it with your friends. A full grown mushroom can be identified if the body is big enough to hold its head. And remember to always check on the color of the mushroom because you don’t want to get poisoned from eating the mushroom you’ve just made. So, did you have fun on this little project? If you did, then good for you! Congratulations on your crowning achievement! You can now consider yourself as a mushroom cultivator. And for those who didn’t have any luck growing a single mushroom, don’t lose hope. Always remember to follow the steps accurately and faithfully, review each step and calculate on what procedure you didn’t follow through. Each ingredient has its own purpose to the project, never over or underestimate the value of these materials because if you do your little experiment will only end up in failure. And always remember, with a little hard work and determination you can now grow your very own mushroom farm at the comfort of your home. The process of growing one is never an easy task, patience and careful measurement are the keys to this project. If you have some questions about the procedure, feel free to comment below. And if you liked it, please share with your friends this wonderful activity.